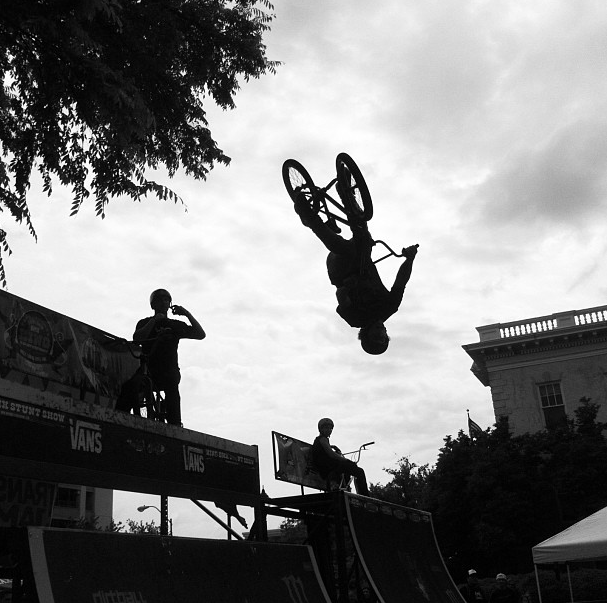 This weekend was the Terrapin Twilight Criterium through downtown Athens. It's a fun weekend. They have stuff planned for Friday night, as well as all day on Saturday and since it only comes once a year we took full advantage of it. They have live music, beer gardens, and tons of festival foods. People come in swarms and cover downtown, and the atmosphere is unlike anything else. Friday night they held the Red Bull Chariot races, which were so much fun to watch. Basically it's a bunch of college guys who built crappy chariots out of random items, duct tape and even baby toys. The carts have only two wheels, must carry someone in the back, and they have to make two laps around the track. Many of them fell apart before the end of the course and the crowds were so fired up. Saturday afternoon we headed down to see the BMX portion. I had only ever watched BMX on the X-games on TV, so it was crazy seeing these professionals doing these tricks in person. It makes me so nervous! My friend Clay took this shot during the event. Very cool stuff. After that we killed some time at Ted's until the prelims started. The weather was supposed to be rainy and nasty, but it turned into such a nice day.. and Ted's is definitely one of the best places in Athens to enjoy a Spring afternoon. Once the night races started we paid to get into one of the beer tent areas right at the curve by the theatre. It was well worth the money, we got access to one of the prime spots and had food and drinks right at our finger tips. My parents and their wild friends joined us later in the night too, and kept us very entertained. It was such a fun weekend, and now that it's over I need a week to recover. But it's finals week.. so it's time to buckle down. I can't wait to be done come Friday so I can enjoy my few weeks of Summer before my summer class starts. Wooo! Good luck on finals! It looks like that was a great weekend! Gosh I miss athens!!! Twilight is the best. Good luck with finals this week love! Love the photos, looks like it was such a fun day!! I need to go to Athens sometime!